The canna is what? The canna is a plant. The canna is a plant that has the broad leaves of banana and flowers in shimmering colors. The canna is a plant rain which goes particularly well with bamboos for example, easy to grow. The canna find its place in every garden, indoor growing and hydroponics, canna blossoming under the sun and summer heat so the canna is very easy to grow under sodium lamp, or other horticultural lighting, try Grow canna under the horticultural, you will be surprised at the result to abundant developments. Canna can be a large plant, did you know? The canna is a flowering plant that can grow to very large sizes in your crops. Said canna plants dwarf measure up to 80cm, the large sizes of canna plants can reach up to 1.20m tall. Their broad, vigorous leaves envelop the stem. They are green or purple, sometimes streaked according to the varieties of canna. Some gardeners prefer them to flowers, the purple leaves offering an interesting contrast with the green allowing to obtain from July to October, the trumpet flowers rising in clusters at the top of the stem. They are yellow, red or orange, sometimes bicolour. Discover the different varieties of canna in indoor culture, all information about the plants and the garden. The highest cannas will find their place in a massif for example, or in groups of ten of the same variety, or in the background of a massive perennial for example which will give a very nice effect. 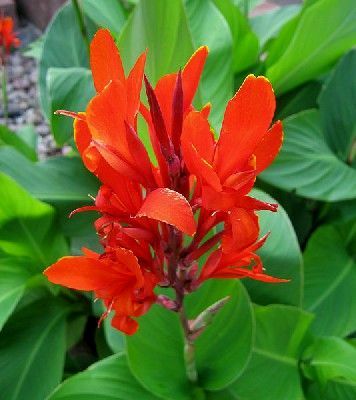 The canna a summer plant, the canna will advantageously take over the spring in a border completely mixed with decorative plants for example. canna is a bad cut flower, which soon wither after being picked. By its tropical side, the canna combines well with bamboos and bananas in order to obtain beautiful composition in your flower gardens. Planting and maintaining the canna both indoors and outdoors, the canna plant is easy to maintain. The planting of the cannas takes place from mid-May (only once the winter period of frosts has passed). Give the cannas an exposure to sun and warm, full south appreciated. The canna grows in a humidified rich soil that contains humid and fulvic acids, permeable and light. First, bury the rhizomes 5-12 cm deep. We can space the cannas 50cm high, the dwarfs 30cm. Did you know ? In pot, cannas grow less and can be closer to each other. So pack them well, pack well the soil that covers them and water abundantly. In summer, with canna plants watering is more regular during the summer but should still remain moderate. Once a week is appropriate, bring the cannas fertilizer rich in nitrogen or a complete fertilizer type Terra Vega brand canna also. Get rid of the pruning shears as and when flowering and the plant will keep a beautiful appearance and allow it to continue to grow. Towards November, once the summer has passed, the foliage of the canna turns yellow. It is therefore the time to dig up the rhizomes and keep them in the shelter during the winter by placing them in a wooden box filled with peat and sphagnum moss, for example, to keep them dry even during the winter. Winter period. Cannas are sold as bulbs are shipped from May mid-February . Know that they settle in the open air in your gardens or terraces as soon as the risks of frosts are passed for the spring. Prepare the location of your cannas by deeply digging the soil to loosen it and remove stones and weeds. Incorporate well-decomposed compost and compost to improve the soil and enrich it. Water abundantly and regularly to cause the vegetation to start. It is possible to start the cannas bulbs under cover, veranda, greenhouse or even inside, by placing the rhizomes in pots in a mixture of equal parts of topsoil and potting soil, to plant them outdoors in May , Flowering thus beginning earlier. Cannas also grow very well in pots, especially dwarf varieties. Can be grown in a type of culture cabinet Superbox , Blackbox Silver or Secret Garden , to grow your cannas plants throughout the year. Then use a rich substrate composed of topsoil and soil type canna terra professional. We then obtain spectacular plants leaving the pots in a saucer filled with water still and by feeding fertilizer types Terra Vega and Terra Flores once a week. Do you have an attack on your cannabis plants? What care for your canna plants? Find suitable treatments for your cannas. Looking for a treatment against slugs, bet on natural predators: hedgehogs, blackbirds, toads and frogs. They will regulate the population of slugs in your garden, did you know? Greet them in your garden by planting a wild hedge. Protect your cannas these voracious snails surrounding their foot of sawdust or crumbled egg shells, materials that make it difficult progression and protect your cannas plants. The red spiders discolor the foliage of the canna and build small cobwebs at the tips of their leaves. The ladybird, its natural predator will get rid of it. Canna indica is the species cultivated in our latitudes. Unlike its common name, "Indian Biscuit", the canna is native to America and tropical Asia. It belongs to the family of Cannaceae near banana which he has ample foliage, robust and decorative. CANNA France what does that? Do you Canna ? Canna is decades of experience in growing plants and especially the hydroponics called hydroponics and intensive collaboration with other pioneers, in fact canna experts from the indoor cultivation for your favorite plants. His passion and love for plants, helped producers to achieve optimal results characterized by the philosophy of CANNA , a dynamic company on the cutting edge of technology on fertilizers and boost growth and flowering plants. Canna solution for the growth and flowering of plants for crops indoor and outdoor cultivation on land, hydroponics and aeroponics, coconut fiber on culture, or GRODAN horticultural rockwool . What plant growth do you want to get in your intensive culture? Self-cultivation is more than just performance. You take the time of your installation - see its germs, grow and thrive. We believe that a rewarding experience means that we enjoy even more the gifts of nature. In the eighties, we began the development of the canna brand. It fascinates us. The knowledge we have acquired, we wanted to share it with other producers. That's why we spent the early nineties, our first food products on the market: Canna Vega and Canna Flores . Experimenting we do it still today with great advances on the future development of culture. We have five research centers around the world for research on your plants. Here we study plant factors, power and location such as climate. On average, we work for at least two years to develop a product. We offer you four product lines, alongside the Netherlands, sold in more than thirty countries. Choose your Canna fertilizer, you get a Canna fertilizer quality, manufacturing, distribution and service: we do everything ourselves - unique in the industry. In this way, we retain control over our distribution, so that we can guarantee quality. Our network has grown tremendously over the past 30 years, we are now talking about many producers. Their practices are a welcome addition to our research and advances. And of course it's nice to hear the successes of our customers. CANNA supports people and organizations in which we recognize a bit of ourselves. Such as indoor cultivation with a strong and capable partner, we sponsorthe music festivals that present new sounds, like World Cup, Beats & Roots reggae and Boogie Down. Athletes who want to make the most of themselves, including in football, horse, car and rowing. And curious students who respond to our school project with the cultivation of vegetables and plants for the advancement of horticulture. Canna is the result of our fascination with nature. We wanted to know each plant and understand the growth process. This is reflected in the price and packagings we choose. For example, vials are made of polyethylene, perfect for being recycled plastic. With BIOCANNA we provide fertilizers to farmers who want to grow organically with crops based on organic fertilizers. How much water does a plant need? Can a plant be sick? Can you develop your own fertilizer? Our food, our food, our fertilizer, where does it come from? The questions above are increasingly being honored. The cooking shows are popular and the food problem is a global important on many political agendas. It is important for young people to be aware that vegetables come from the supermarket, but that is a complex process. With that in mind CANNA to start in 2009, "the draft culture High Schools" vegetables. For students engaged themselves to growing vegetables, and increase their harvests abundantly. Now, years later, we are working closely with a dozen schools and we have developed a comprehensive program, coupled with the existing project. The program is designed to raise awareness of education. The program is a practical set that experience and learning go hand in hand. The package focuses on competencies and in line with objectives. In this program, students with nutrients and Canna substrates in growing tents will grow plants. The special "inner culture" is that you have control over the area of ​​the plant that you develop throughout the year. Do you do what it takes to get good growth in your crops? Do you have food problems or just want to learn how to grow better? With these movies , we provide a solution to problems encountered by amateur growers. For fans, we have added a pdf of support among the movies with a detailed explanation. Discover the range CANNA , fertilizer canna and BIOCANNA in indoor growing, your growshop for indoor growing with canna.